These days I do all my chess writing/editing/type setting with Open Office. I find it just as easy to use as Word, and most importantly, I'm not locking my data into a proprietary format that may become redundant at some future time. However there are a couple of gotcha's that are worth noting if you plan to shift away from the evil empire that is Microsoft. The other trap is page numbering. If you want to start page numbers from something other than 1 (which I often have to do with ACCQ), the obvious "Page Offset" when formatting your page number fields doesn't work as advertised (it does something completely different). Instead use the Format->paragraph->text flow option on the first paragraph of the document and insert a page style. This does the trick. Regular blog readers will notice that I've added a couple of extra icons on the left hand side of the page. I've already discussed chessgames.com in an earlier post, but I haven't talked about the other one, until now. chessworld.net is an online turn based chess server (as opposed to a real-time chess server). This means that is more akin to correspondence chess (in that the time between moves is measured in days rather than seconds) than OTB chess. It follows the same membership model as most online chess servers these days (free to join, paying members get more features), and it seems to be a pretty vibrant set up. Indeed I only joined last Thursday, received 5 game invitations by Saturday, and even completed one game by this morning ( lasting a total of 6 days). Of course not all games are going to be like this (it was a bit of a massacre after move 15), but if you are looking for CC style chess that is a rung down from seriousness of the ICCF Webserver, then chessworld.net isn't a bad choice. Late last year I posted a very grainy ("Look, it's Bigfoot!") quality video from Street Chess. Well now I've got some new toys I'm able to produce a slightly higher quality product. My first effort was filmed a couple of weekends ago and features the end of the game between Emma Guo and Endre Ambrus. The video is hosted on Youtube and can be accessed via this link. The Schliemann variation of the Ruy Lopez is one of those openings that sits just on the wrong side of acceptability. It occasionally pops up as a suprise weapon (Speelman's win over Short in a Candidates match being an example) before slipping back to obscurity. The latest super GM to bring it out into the open is Teimour Radjabov who has played it twice so far in the FIDE GP in Baku. In round 4 he drew with Peter Svidler, and in Round 6 he tried it again aginst Shakhiryar Mamedyarov (a game still in progress as I write this). I have a soft spot for this opening as it is one of my choices against the Lopez. Although I must confess I also shelved it for a number of years (playing "serious" openings instead), but of late have used it once more (including one online CC game which may, when finished, be my quickest CC game yet played). Here is the Svidler v Radjabov game, which is interesting in that Svidler decided not to challenge the opening "head on", but instead went for the solid but unambitious 4.d3. Without a doubt, the finest television show ever made was "The Prisoner". Ostensibly a spy thriller, on another level it was a sociological tract on conformity and rebellion in society, and on an even deeper level, an allegory on the suppression of Welsh culture by the English. But apart its deep intellectual underpinnings, it also had an episode dealing with chess. "Checkmate", as it was imaginatively named, began with a chess game using living pieces, and explored the themes of who controlled who in society. As part of the series it was one of the better episodes, only ley down by the rather cavalier approach to representing the chess game itself. Of course this is just nit-picking by a chess player and doesn't detract from the quality of the series itself. And if you are interested in seeing the series, I've seen DVD box sets for under $50 around the traps. One new thing I learnt while playing at Dubbo this year was the existence of the NSW Country Chess Circuit. The idea of Gary Losh, it is the informal collection of NSW Country Weekenders that are also part of the Myer Tan Grand Prix Series. There are 8 tournaments in total, although 3 (Toukley, Newcastle and Dubbo) have already been completed. The next 2 events in the series are Laurieton (3 May 2008) followed by Mingara (17 May 2008). The Mingara event is already looking good, with extra money going into the prize pool. There are also plans to have an extra prize event following the last round, and hopefully I'll have more details soon. While for this year the Country Circuit is mainly about coordinating publicity for NSW Country chess events, next year may even see the addition of prizes for the best scoring players in the series. www.chessgames.com is quite a useful online reference for chess players. Using the sensible model of free to access (and join) but an extra charge for premium services, chessgames is basically an online database and discussion board. Extra features include additional search tools, guess-the-move functions and additional opening/ending resources. One feature that is free (even to non-members) is the ability to search by player name. And when you do this you even get a little biography of the player concerned. However in most cases (especially for Oceania players) this information is very sparse. So I've had a request for help from on of the biographers there. He is interested in getting up to date information about Australian/New Zealand/PNG/Fiji players. The sort of information he is after is mundane things like date and place of birth, country of residence, but also more significant information like notable tournament victories, representative honours and dates of title and norms. Despite being the editor of Australian Correspondence Chess Quarterly, I don't play as much Correspondence Chess as I should. In fact since taking on the job I've haven't played at all. The closest I've gone is playing some games on Facebook. Of course these aren't serious games (eg no time limits) but that doesn't mean I haven't taken them seriously. As if to make up for not playing CC when I should be, I put in as much effort as I would for a tournament game (although when discussing the game with my opponent tonight he described his own effort as "I looked at the game for a couple of minutes and played whatever looked good"). Of course such quality doesn't come cheap, as it has a list price of 221.50 GBP, which is about $550 Australian. But apparently I'm a valued customer and they are willing to negotiate a special price, "just for me". 11 years from now, Los Voraces, New Mexico, will host the strongest chess tournament in history. At least according to the entertaining novel "Los Voraces 2019" by GM Andy Soltis. The novel, published in 2004 describes what happens when the 14 best chessplayers in the world are taken to a small town in the middle of the desert, without computers, trainers or mobile phones, to play a tournament that essentially the rest of the world knows nothing about. While I found the book amusing (especially as the story is narrated by the tournament arbiter) I was also impressed that Soltis peppered the novel with actual games of chess. In his introduction he states that most of the games are real, and I commend him on his choice of a number of interesting clashes. Here is the first round clash between GM Qi (CHN) and GM Boriescu (ROM). If you are interested, this game appears to be based on the game Busch - Gosev 1990, which is identical up until move 18. Courtesy of Chessvibes comes news of the FIDE Grand Prix series which has just begun in Baku, Azerbaijan. Of special interest (to me at least) are the rules covering drawn games. applying the rule of 50 moves (he writes his move on his scoresheet, and declares to the arbiter his intention to make this move which shall result in the last 50 moves having been made by each player without the movement of any pawn and without any capture, or the last 50 consecutive moves have been made by each player without the movement of any pawn and without any capture). The Chief Arbiter may consult with the Technical Adviser before accepting any claim by players for a draw. The Chief Arbiter is the only authority who can acknowledge the final result of the game in these cases. NB The major difference between these rules and those in effect at the 2008 O2C Doeberl Cup, was that these rules apply for the entire game, and not just for the first 30 moves (as in Canberra). What is also interesting is that the FIDE are essentially using the same system that was used at the Doeberl Cup, with the Chief Arbiter making the decision concerning drawn games, but consulting with a Technical Adviser (in our case GM Ian Rogers) if necessary. The Technical Adviser must be a Grandmaster, rated at least 2500, who has held the title of Grandmaster for at least ten years and is an active player as defined by the rating system. Despite announcing his retirement from chess, GM Ian Rogers still meets this criteria. But the broader issue is that FIDE acknowledge that in enforcing this rule it isn't necessary to call on the services of Kasparov, God, or the ghost of Bobby Fischer to decide what is or isn't drawn. Having almost sorted out all the remaining issues with my insurance company, I splashed out on a new camera. And since it has been a while, I took a load of photo's at Street Chess, just to test it out. You can see them by clicking on the "My Chess Photos" link on the left of the page. To be honest there isn't anything new in the album, just shots of players enjoying themselves in the chilly Canberra weather. From 1998 to 2003 Paul Dunn and myself hosted a weekly radio show covering chess. Simply called "The Chess Show" it was on Sunday nights on 2SSS-FM here in Canberra, Australia. The only reason the show ended was the station closed down, otherwise I'd probably still be hosting it. While the main focus was on local, national and international chess news, the main reason I did it was the opportunity to play music that I liked. While the only connection that the music had to chess was its appearance on The Chess Show, for those that remember the show, or for those who are curious, here is a list of songs that I played fairly regularly (in no particular order). plus the Chess Show's opening and closing themes, which were written and recorded by my brother Brendan. I don't know what the modern equivalent of the "mix tape" is (maybe the mix pod?) but whatever it is, you can always use the above list as musical accompaniment to your chess study sessions. During the 2002 and 2004 Chess Olympiads, I roomed with Manuel Weeks. Manuel was the captain of the Australian Mens Team, while I was playing board 3/2 for the Papua New Guinea team. While Manuel was kept busy by his Australian duties he did find the time to help me with opening preparation. In 2004 he showed me an interesting idea against the Scotch Game. I didn't get the chance to use it, as my opponent varied early on. (That game ended in a quick draw followed by a drug test) So the idea has been sitting on the shelf for the last 4 years, until my game last night. Unlike Frank Marshall saving up his gambit to use against Capablanca, I don't think I'd had an opportunity to use it in the last couple of years. This may have been because my opponents avoided main line Scotch, but the more likely cause is I simply forgot about it until now. But having remembered it, I decided to wheel it out. From the Dubai Open comes the news that a player was expelled from the tournament after receiving advice via his mobile phone. M. Sadatnajafi, from Iran, was caught on move 10 after arbiters saw him looking at his mobile handset. When examined the phone contained text message from a friend in Iran who was following the live broadcast of the game over the internet. Full story here. As promised, here are my games from day 2 of the 2008 Dubbo Open. The first was against Garry Mann and I was helped by the fact that he ran himself short of time as early as move 20. Of course at the tournament time limit (G60+10s move) this is likely to happen, but you still need to be aware of the consequences. In this case moves like 29. ... Qe6 and 33. ... Re7 had as much to do with posing my opponents problems as they had to do with any objective merit. In my Round 5 game I was just crushed by Mos Ali. The seeds of defeat were sown as early as 9.Re1? where the idea of forcing e4 was never going to be good, while the idea of preventing e5 with 9.Rd1 was clearly better. My last round game was against defending champion Bill Egan. When I started playing chess 25 years ago even taking a half point from Bill was a huge achievement for me. However I'm a little more ambitious these days, and even knocked back a draw offer on move 32. Possibly Bill chose the wrong moment to make the offer as I was just getting my queenside pawns rolling, and so had something to do for the next few moves at least. Many years ago a friend of mine was a strong junior player, and was playing in an ACT Championship. Now my friend who I'll simply call David (although I'm sure would be happy if all names were revealed) , was playing a many times ACT Champion. And David was winning. In fact so winning that his opponent (who I'll leave nameless) should have resigned. However in those days we still had adjournments and at the appointed hour the opponent insisted that David seal a move. Why David's opponent insisted on this, when anyone else would have resigned became clear at the resumption. David's opponent was hoping that David (who was still in his early teens at this stage) would seal an ambiguous or illegal move, and therefore he could claim a win. And indeed that is what happened. David failed to differentiate between the 2 rooks that could have moved to the same square, and by the rules of chess lost. But what annoyed David wasn't the loss, rules being rules after all, but both the circumstances of the loss (ie using the adjournment as the only possible way of winning) and the faux sympathy exhibited by his opponent after the game. So David simply made a vow to beat his opponent in every single game of chess they played thereafter. And he did. Every time they sat down to play David beat him. Long tournaments, short tournaments, lightnings etc David made it his life's mission to defeat his nemesis. Not even a single draw was conceded. The beatings only stopped when David retired from chess in his early 20's. Which must have come as some relief to his opponent. But there is one final postscript. Despite being out of chess for 5 years or so, David decided to play in a lightning tournament at the ANU, and as it turned out so did his old opponent. So when they were paired with each other, David crushed him once again, just for old times sake. Here is rough breakdown of time and money spent playing chess in Dubbo. While I traveled from Canberra, this could equally apply to Sydney and Newcastle(?) as they are all about 400km away from Dubbo. So if you've got 40 hours and $270 it is a relatively simple task to play in a NSW Country Weekender, be it Dubbo or Blayney or Toukley etc etc And if you travel with a group, (2,3, or 4 people) then expenses can drop below the $200 mark. First place was won by Tony Weller (QLD). Tony had a perfect 6/6 and won $350 for his efforts. Second place was shared between David Castor (NSW) and Allen Setiabudi (ACT) on 5/6. As Allen was also the best U/1600 player, a whole raft of people (including myself) snuck into the prize list with a 5 way share of 3rd (really 4th) place. My score of 4/6 was achieved by grinding out wins in rounds 4&6, and simply getting outplayed in round 5. Game scores over the next couple of days. At the end of Day 1, top seed David Castor (NSW) is tied for first place in the 2008 Dubbo Open. David has 3 wins from 3 games, along with Tony Weller (QLD) and Mike Canfell (NSW). They are followed by about 10 players who are on 2/3. David won the 14 player lightning tournament last night with a perfect 6/6. In what was a lighthearted event other prizes included 'Biggest Blunder', 'Weirdest Game' and 'Quickest Win'. I tried for all 3 by playing various gambits including the Kings, Sorensen, and Englund but came up empty handed. After winning my first game yesterday, I decided to protect my +1 score by having a couple of quick draws in rounds 2&3. Most of the game was theory (at least up until move 14), and every time I played a move I felt I was being mocked by the ghosts of 19th century German theorists. From move 11 onwards I planned to checkmate my opponent, starting with Bxh6, but never quite had the firepower to pull it off. By move 20 we were both short of time, and he offered a draw around move 25, but I played on to what I thought was move 30 before returning the offer. The 8th Dubbo Open has just started, with a record field of 30 players. Players from all around country NSW have entered, along with the odd Queenslander and a large contingent from Canberra. I made the trip up this morning, once again proving that if I leave home at 6am I can travel to anywhere in the world, and be on time. While the first round is still under way I had a good game to start with, catching my opponent with some opening tactics (8.Qe2, 9.f5! ), to win material, and the game. Sad news from the Canberra chess scene, with the passing of long time player and organiser, Peter Murphy. Peter had been a member of the Belconnen Chess Club since moving to Canberra in the 1980's and in the past year had run the club and organised it's tournaments. Peter attended last months Doeberl Cup as a spectator player in the Minor, and looked his usual self, so his death (on the 4th April 2008) has come as a shock to those that knew him. Here is a game from the 1993 ACT Chess Championship where Peter defeated future Women's International Master Laura Moylan. While GM Ian Rogers was the undoubted video star of the O2C Doeberl Cup, Israeli IM Igor Bitansky also had some camera time, after playing what he described as the "game of his life". Here is the score of the game, and you can watch the video here. While my trip to Hong Kong last year was enjoyable, about 4 days in I lost my camera (A FinePix S5600). Fortunately I was insured and filed a claim with my insurer. After a degree of waiting, due to the inevitable "the person handling your claim has left the company" problem, they got in touch to organise a replacement. Now the original value of the camera was $370 with a memory card costing an extra $80. But silly me didn't have an excess waiver in the policy, so to get a replacement I would still have to stump up $250. At first I was happy to do this, as I was assured by my insurer that the quote for the replacement camera (a S5700 btw) was "well in excess of $250". However I thought it would be prudent to check some prices and amazingly the very first camera store I walked into had an S5800 (the next model up) for only $299. So I had to make a choice. Pay $250 for an inferior model, or have the insurance company cut me a check for $120 (the difference between the excess and the replacement value), and buy my own (better) replacement for $299. The first choice costs me $250, the second, only $180. So I opted for plan B. However, lest you jump to the wrong conclusion, this wasn't a problem with the insurance company, it was with who the insurance company buys their items from. As I said to the claims officer "Someone is getting gouged here, but it shouldn't be you, and it certainly won't be me"
So for now I'm reduced to taking poor quality photos with my mobile phone. Hopefully this will change when I get my replacement camera, but if you want to see my phone pics from this years Doeberl Cup, just click on the "My Chess Photos" link and look at the 2008 O2C Doeberl Cup Gallery. For me I'm just hoping to play another game like this one. After the game my opponent said "Around move 20 I felt I was being tricked, I just couldn't work out how". Chinese players finished first and second in the 8th Bangkok Open, which finished yesterday in the Thai capital. Xiu Deshun scored 8/9 conceding only 2 draws, to GM's Akobian and Li Shilong. The untitled Deshun had a performance rating of 2679, but due to the fact that the field only contained 2 GM's, only scored an IM (rather than a GM) norm. Second place was also taken by an untitled Chinese player, Zhang Ziyang. Ziyang scored 7.5, losing to the tournament winner, and drawing with Akobian. However Ziyang appears to be even unluckier than Deshun, in that despite a performance rating of 2592, Ziyang only played 3 titled players, invalidating any norms. Equal 3rd was shared been GM's Akobian and Shilong on 7/9. Australian players Tim Reilly and Matthew Drummond score 6/9 and Sean Watharow scored 3.5 Full results are here. Not a full blown review, just to note that Big W are selling the version for Nintendo DS for $24. I bought a copy on Friday and have a had a couple of goes with it. I haven't used it enough to see how strong it is as a chess playing program but I did like the new "Mini-Games" feature. Basically it is a series of games that use chess pieces, without actually being chess itself. Some games involve using pieces as mine sweepers, while others require you to line up 3 or more pieces in the lines they move along. Quite cute and quite addictive. And the more you solve the more Josh Waitzkin rates your mental abilities. Whether it matches pocket Fritz etc I still don't know, but for a fun DS game for $24 it is certainly worth buying. I'm almost too embarrassed to discuss the diagrammed position, as it is one of the most fundamental ideas in Rook and Pawn Endings. But (a) I assume not everyone has seen it and (b) at least two games at the SIO ran on far longer than they should because it wasn't clear that the player with the pawn quite knew what they were doing. The position is of course the "Lucena Position". White would like to get king out of the way of the pawn, allowing it to queen, but is met by annoying checks from the black rook. The simple plan is to (1) get the pawn to the 7th rank (2) drive the enemy king away from the e file with a rook check (3) move the rook to the 4th or 5th rank so that after (4) moving the king to f7 (5) enemy checks are met with a zig zag to g6 (or g5) when blacks last check on the g file is blocked by the white rook. The actual moves to do this are 1.Kh7 Rh2+ 2.Kg8 Rg2 3.g7 Rh2 4.Re1+ Kd7 5.Re4 Rh1 6.Kf7 Rf1+ 7.Kg6 Rg1+ 8.Kf6 Rf1+ 9.Kg5 Rg1+ 10.Rg4 +- Of course 4. ... Kf6 is met by 5.Kf8 avoiding any more checks. In the actual games at the SIO one player failed to transpose into the Lucena position, by giving up an extra pawn, and after much play (and muttering by the spectators), managed to only draw the game. In the other, the player with the extra pawn was on the verge of defeating his (unnamed) GM opponent, but made heavy weather of it, possibly due to the pressure of getting the win. I suspect his opponent sensed this, as at some point the (unnamed) GM stopped the clock and bizarrely claimed a draw by two-fold repetition. The arbiting team treated this as a claim for a three-fold repetition, which was then rejected as incorrect. The disturbance didn't effect the outcome of the game as the (unnamed) GM eventually lost. I'm starting to look through the games from the 2008 O2C Doeberl Cup, as I have an article or two to write on the tournament. And while the following game might not make it into the print version of the tournament report, I thought I'd highlight it here. 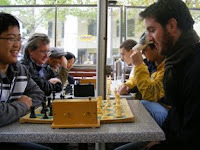 It is between long time ACT Chess Association member Adrian Flitney, and New Zealand visitor Bob Mitchell. The Bangkok Open was the third tournament in the Doeberl/SIO/Bangkok series of international events, although the large traveling distance between Australia and Thailand meant that it was unlikely to have more than a few players in common. The winner of the O2C Doeberl Cup Varuzhan Akobian is playing, although Rogelio Antonio, who was going to play, failed to show. After 4 rounds the lead is shared between Xiu Deshun (CHN) and Li Shilong (CHN) on 4/4. Akobian is on 3.5 along with 2 others. 23 Countries are represented with 17 players from Thailand, 17 from Malaysia, and 9 each from China and Hong Kong. Full results here and the tournament homepage is here. If you are running a blog, especially one with an unmoderated comments section then the following tool may come in handy. The StupidFilter, available from stupidfilter.org, classifies posts by their level of stupidness. Each body of text is checked against a criteria, and given a "stupid" score, from "this post isn't stupid", to "George W. Is that you?". Interestingly the classification isn't based on whether you say stupid things ("Extended warranty. How can I lose! "), but whether you say them in a stupid manner (excessive punctuation!! !, OVERUSE of CAPITALS, and AFAIK, the use of silly acronyms). While it can be installed on you own computer, probably the best way to test its effectiveness is to visit the website and try their online demo. However Malcolm Tredinnick, (who gleefully pointed out the existence of the tool to me), warns that entering posts from various Australian chess discussion boards may result in your computer bursting into flames. The deadline for April Fool's Day pranks has past, and now I feel it is safe to post. While I didn't play any online pranks myself (although the last line in yesterdays post did unintentionally catch the unwary) I feel it is fitting to post one of the great April Fool's Chess related gags. The following review first appeared in Gamespot Computer Game Magazine and I reproduce it here (rather than link to it) as I cannot find the original on the net. game that won't keep you busy for long. with a rival country of equivalent military power. lacking. For one thing, there are only six units in the game. base for a game that simply cannot sell itself on its own merits. by the fact that both sides are equally equipped with only one. is, in fact, very little of either element to be found. begin in front of your more useful forces, thereby blocking them off. King is threatened, that player is placed in a state of "check." are available. If he cannot defend his King, he is defeated. Yawn. instrumental in defeating an opponent if you plan accordingly. purchase more), matches end in disappointing stalemates. play. Thus no real variety can exist between competent players. not entirely elegant simplicity, will garner a small handful of fans. classics they are to this day.